A ton of Google apps have already gotten Material redesigns, and Voice is the latest to join the party. Following yesterday's Gmail redesign, several readers have tipped us off on a new and improved UI in Voice. And yes, we have the APK for you guys to download. Arguably the most noticeable change is the whitening of the status and navigation bars. I'm not really sure why Google left the bars dark for so long, but that update alone makes a big difference. You'll also notice that the icons on the bottom are hollowed-out in the redesign, and the text description now only appears under the tab that you're currently in. 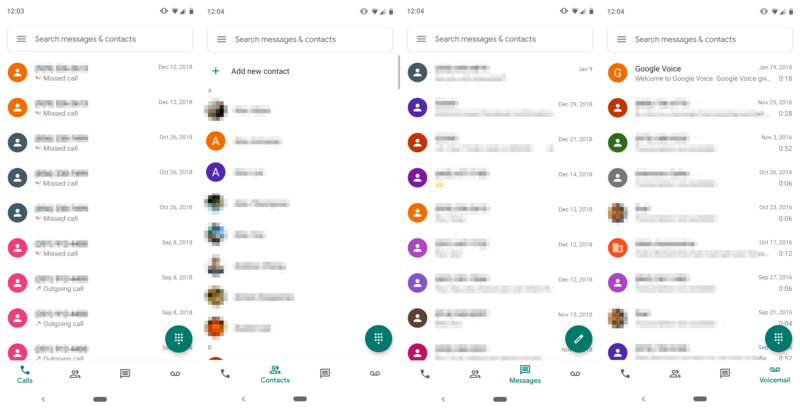 Plus, the bar with the search icon on the top right has been replaced with a full-width search bar, like most of Google's other apps these days. Overall, this is definitely a nice redesign, making the app look a lot more modern. If you'd like to get this on your device and you can't wait for the update to hit the Play Store, we've got the Voice v2019.05.2308 APK over ready for download over at APK Mirror.